Step 1 In a bowl, blend the matzo meal, melted butter and walnuts together with a wooden spoon. Press the mixture into the bottom and slightly up the sides of a 10-inch springform pan. Chill while preparing the filling. Step 2 Heat oven to 325 degrees. In the bowl of a food processor or using an electric mixer, blend the goat and cream cheeses together. Mix in the eggs, followed by the sour cream, salt, tarragon and pepper, beating well. Step 3Pour the mixture into the chilled crust and place the pan on a baking sheet. Bake until the center is set, 50 to 60 minutes. Turn off the oven and let the cake remain in the oven for 30 minutes. If serving warm: Cool down to just warm, carefully remove the outer ring, slice with a knife dipped in ice water and serve, or cover with plastic wrap and chill till firm. In Recipes-list.com we have selected the most viewed recipes from category - Appetizers Main courses Vegetarian . Enjoy the best recipes specially selected for you! 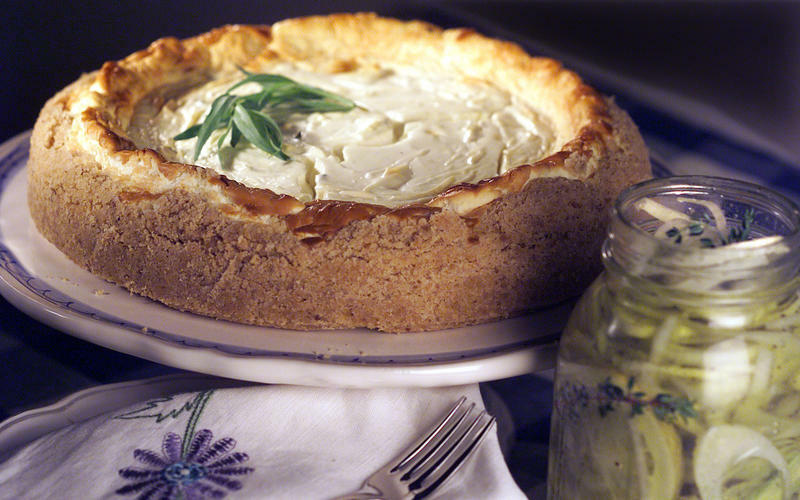 Tarragon-scented goat cheese cheesecake is the right choice that will satisfy all your claims.